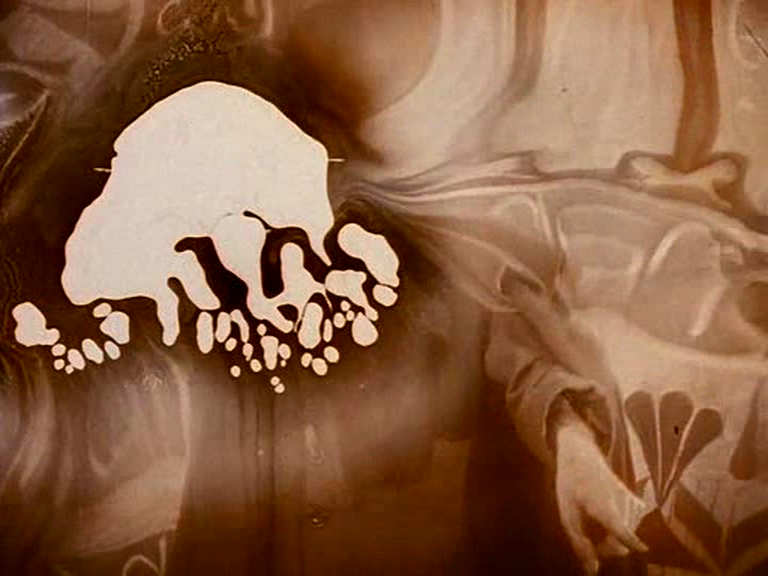 This image comes from THE MESMERIST, a short film by Bill “DECASIA” Morrison, which takes a sequence from a silent film, THE BELLS, and isolates it, slowing it down to allow us to appreciate the terrifying beauty of the nitrate decomposition that’s eating the print alive. Imagine that white flicking and sparking all over the frame, while the image itself warps and billows as if projected on a sheet somebody’s pummeling from behind. Fortunately, better prints of THE BELLS exist, so I’ll be able to check out this early appearance by Boris Karloff as a Caligari-esque fairground hypnotist. It’s his first vaguely horror-movie role. I’m also interested because the film is based on a story by Erckman and Chatrian, whose work I researched when I was making my movie CLARIMONDE, which was based on a story by Hanns Heinz Ewers, but also drew on related work by Theophile Gautier and the writing team of E & C, who were a sort of conjoined latterday ETA Hoffman, only not so brilliant. Morrison’s other film from THE BELLS is called LIGHT IS CALLING, and it’s even lovelier and more tragic. I was wondering what these images reminded me of — experimental films send my thoughts flitting about, whereas narrative works tether my brain to the unfolding events — and I thought of Max Ernst’s painting Europe After the Rain, a sort of apocalyptic vista of psychedelic distortion, created by a technique Ernst called decalcomania: you’ve probably used the approach at nursery school without hearing the big word. Simply paint one sheet of paper thickly with different hues, press another on top of it, then peel them apart, to create beautiful abstract patterns. And of course, that’s how Morrison’s work is created too. As the nitrate stock deteriorates, the surface turns to jam, and the whole reel gets gummed up. 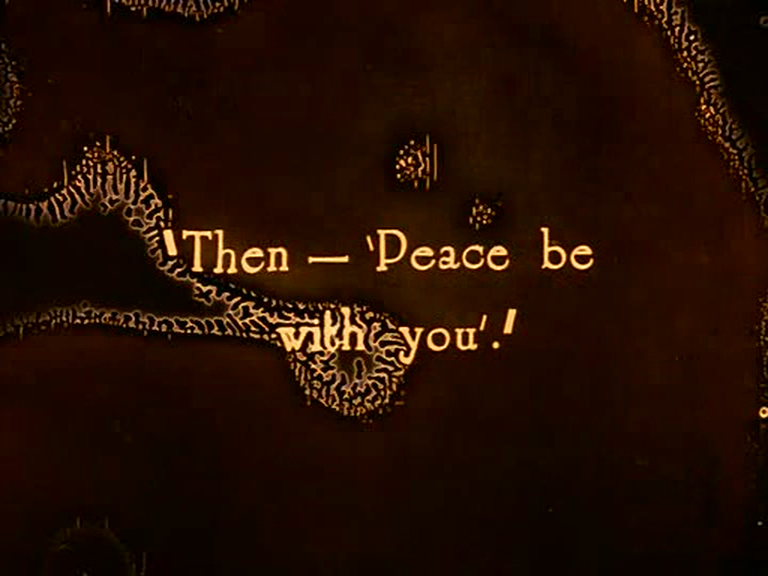 As the film is unspooled, the celluloid strips aways from itself, exactly like those sheets of paper when you were four, and with similar results. THE BELLS peeled. The way the sepia tinting oozes like marmalade and assumes myriad hues made me think of a print by Turner of ships at sea that hung framed in our house when I was a kid, a golden mist through which shapes loomed in abstracted outline. Equally, I was reminded of Andres Serrano’s ludicrously controversial work, Piss Christ, in which an image of the Crucifixion glows dimly through obscuring golden clouds of urine. I also thought of Ralph Steadman’s Paranoids, Polaroid images mutilated with a blunt instrument as the image is still developing, squashing and stretching facial features to turn likenesses into unlikenesses, actualité caricatures. I was never able to get that to work, although I did have my Polaroid taken by a ghost once. Beat that, Steadman.